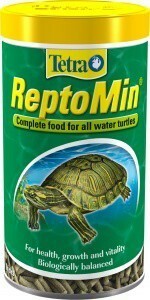 Details: Reptomin Complete diet for aquatic turtles. Easy to eat stick formulated to match the carnivorous natural diet if aquatic turtles. Optimum calcium to phosphorous ratio (3.5:1) for healthy bone and shell growth. New Active Formula for increased disease resistance and vitality. Contains a high proportion of easily digested protiens.